The two films immediately to which Europa Report will probably be compared are Apollo 18 and 2010. I haven’t seen the former – to my benefit from what I heard and read about it – but 2010 is a pretty apt analogue, aside from the obvious similarities in plot. Europa Report is an earnest shot at a space exploration film that has a lot of the same heart that was found in that Roy Scheider joint, although in this case there’s no giant space baby waiting for the intrepid crew heading for Jupiter’s neighborhood (there is something, though). What’s more, the film pulls off – and surprisingly well – the found footage thing, although in this case it’s more “beamed” footage. The film features generally solid performances from the cast, set against the claustrophobic environment of a space ship, the production design of which, is one of the most impressive things about the movie. The premise is a familiar one: unmanned probes to Europa, one of the moons of Jupiter, signal that there may be life, more than likely of the single-celled variety, in the oceans underneath the thick ice of the moon. So a privately-funded manned expedition, Europa One, is launched to investigate. The crew is staffed up as one would expect, with experts in engineering, astrophysics and also marine biology. The film is presented fauxdoco style, with vignettes from the nearly two-year journey to Europa, alternating from early in the mission to touchdown on the moon. And also interviews with the support team of the mission from Earth. Not too long into the mission, there’s an incident in which one of the crew is lost, and the rest of the crewmembers are forced to continue with the mission objective to reach Europa, set down upon it, drill into the ice and see if there’s anything out there worth getting to know. The mission and the story then follow what is a pretty standard scenario. Considering that this is a found footage joint, you can guess how things are going to go, for at least some of the crew. The difference here is that, unlike some found footage films with jerky cameras movements, Europa Report is a pretty damn good-looking film. This is a credit to Ecuadorian director Sebastian Cordero’s decision to employ cinematographer Enrique Chediak (127 Hours) to use a multi-camera system on a gimbal within the 360-degree ship set, which was designed by Oscar winner (Pan’s Labyrinth) Eugenio Caballero. Again, the effort here is pretty earnest, based upon – according to the filmmakers – considerable consultation with NASA and SpaceX, as to what a near-future privately-made spaceship would look like. The goings-on during the mission are made to be as realistic as possible, and the film benefits from the attention. The cast is international and headed up by Sharlto Copley (who should probably run if he ever sees another spacecraft, man-made or alien) and Embeth Davidtz, along with Michael Nyqvist (The Girl With the Dragon Tattoo), Karolina Wydra (Be Kind Rewind), Daniel Wu (The Man With the Iron Fists), Christian Camargo (Dexter) and Anamaria Marinca (4 Months, 3 Weeks, 2 Days). 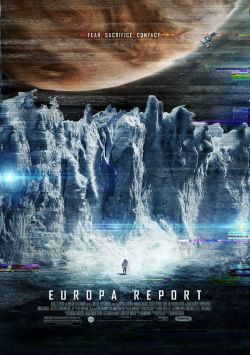 Europa Report doesn’t quite qualify as a great sci-fi film, but it is a good one with nice execution behind and in front of the camea and great production design.